Do not needlessly kill or injure the local inhabitants. Behavior such as looting and violating women is strictly forbidden. Buildings and property in enemy territory must not be burned without permission. Scrupulously keep secrets and main security. Treat ammunition carefully, and reduce waste to a minimum. ww2dbaseDuring the New Guinea campaign, Major General Horii achieved the impossible by leading a column of 8,500 men of the 144th Regiment across the Kokoda Trail over the treacherous Owen Stanley mountain range. Even though he achieved surprised and initially drove back the Australian defenders, logistics across the trail broke down, and his troops began to fight on empty stomachs. 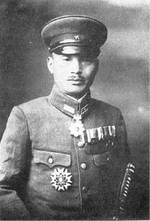 Mainly because of a change in the overall war situation, Horii was ordered to fall back onto the trail, marching all remaining soldiers back across the Owen Stanley for Buna on the northern coast. He knew it was no easy task to cross the trail once again, but the food situation rendered him without choice even if he did not receive the order to fall back. En route, Horii took a misstep while crossing the Kumusi River and drowned. ww2dbaseSources: Darkest Hour, Goodbye Darkness, Wikipedia. 1 Jan 1890 Tomitaro Horii was born. 23 Nov 1942 Major General Tomitaro Horii, his chief of staff, and another staff officer died when the canoe on which they traveled aboard capsized in the Kumusi River in Australian Papua.